Due to popular demand, all of our 2-piece, lightweight rotors will now come with black anodized rotor hats featuring Type 3, hard anodizing, the highest quality and hardest anodizing available for aluminum. This will make the rotor hats more resistant to fade and wear and will hide brake dust better. Due to popular demand all lightweight rotor rings will also feature zinc plating. This high quality coating will slow the effects of corrosion and keep your rotor rings looking good through the winters. 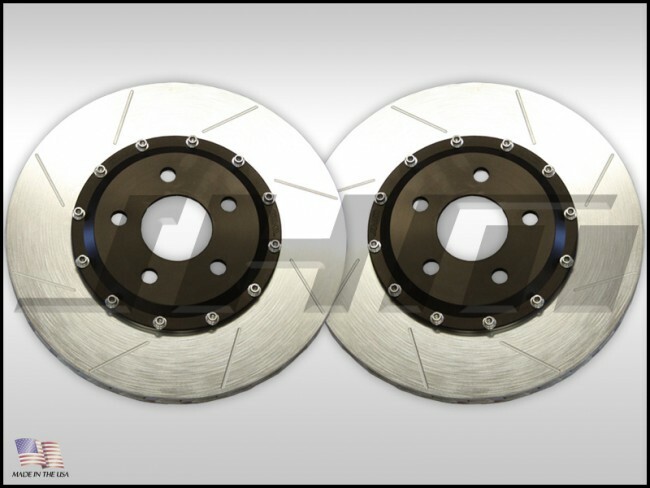 These rotors shave 14.5 lbs of unsprung weight from the front of your car while increasing braking performance, plus they bolt on just like stock! This is great alternative to a full on Big Brake Kit since the stock B8-S4 and S5 rotor is already a stout 345mm (13.6") and most may not want to spend $2,000 plus for a full Big Brake Kit. We basically brought the same high performance great cooling designed rotor to these drop in (fit like stock) front rotors and at a 1/4 of the price or less of a full Big Brake Kit. INCLUDES: 2 - JHM 2-piece Lightweight Front Rotors. 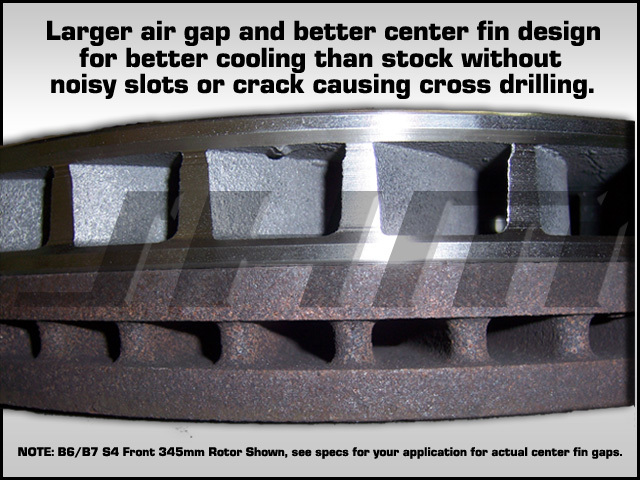 (Each rotor weighs 7.25lbs less than stock for a total of almost 14.5lbs weight savings.) 31% lighter! We worked closely with a race brake manufacturer that supplies many NASCAR racers and a couple major brake kit companies. Due to their expertise we chose to have them build us the outer rings to our specs to fit the B8 S4 and S5. The rings feature 12 attachment points for durability and strength. We CNC machine the Aluminum center hats in house based on their recommended materials and thicknesses for durability. 12 attachment points for durability and strength. We also engrave JHM in them in 3 locations equal from each other, it looks clean and doesn't jump out or look tacky. NOTE: With the installs we have done we have found that our slot design is whisper quiet. NOTE: Due to differing scale calibrations our estimates on our rotors are slightly high.